Discussion in 'Android Tablet Usage, Tips & Tricks' started by xaueious, Aug 12, 2010. You can find the apk here in case you don't have Market on your device. This tool allows you to identify the hardware inside your device. What's the name of the file on your server index? No idea as to the builder, this is outstanding. I have been trawling trying to find a system descriptor just like this. No problem! I just couldn't find it on the list? I wish I had this prior for the other clone from China would have been nice to know what made that tick. Anyway thanks. Oh by-the-way What's the torrent.apk for? Is that a BT client for android? I have already downloaded the zip file, decompress it but don´t know how to install it. I can not find it on market. Please advice. I usually install via ADB, but I believe you can install this by typing the link in your Android device's browser. Use a webpage such as bit.ly to shorten the direct link to the APK file. 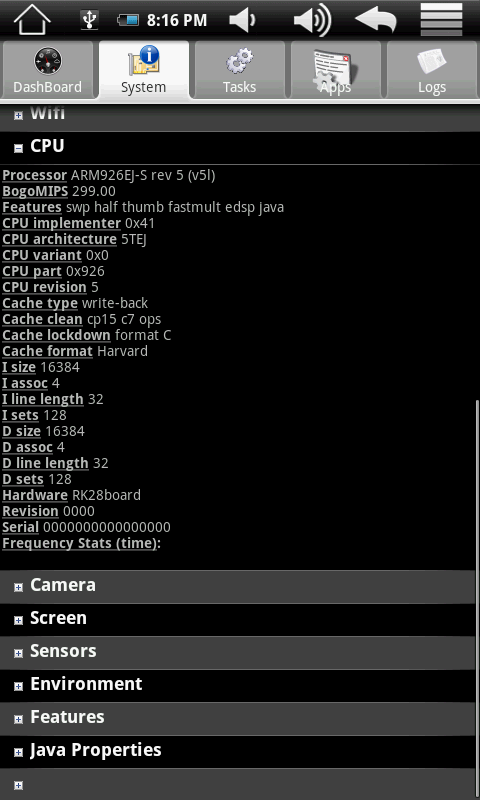 The touchpad and system seem slow and jittery (firmware problem?). I also can't access the 'real' android market or get flash/youtube to play. Can someone please tell me how to root and upload a new ROM or firmware. I understand i just need to put it on my SD card - but i don't know what to put on there. Thanks for all the tips and how-to posts so far!! WIDGET WONT WORK IF YOU MOVE ASI TO SDCARD (it is an android limitation). This loaded application comes with five main tabs: Dashboard, System, Tasks, Apps, and Logs. 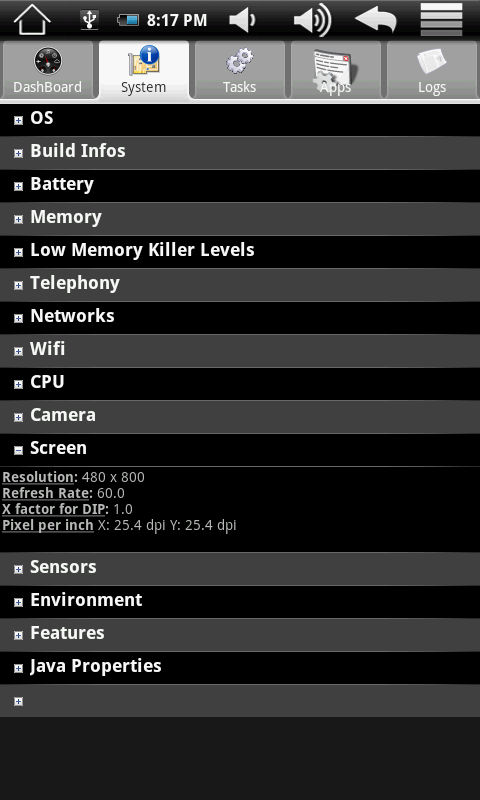 Lookup handy info like how much battery, internal memory, SD card space, and RAM you have free. View uptime (time since the phone was last shutoff), current network type (e.g. WiFi) and IP address. A sortable list of opened apps including their memory and CPU usage. Quickly switch to or end a specific task/app. Great functionality, just like what you&#8217;d find in Advanced Task Manager (and it looks like plenty of Android users enjoy the task killing capability). Launch, manage, uninstall, or view the specific app in the Android Market. 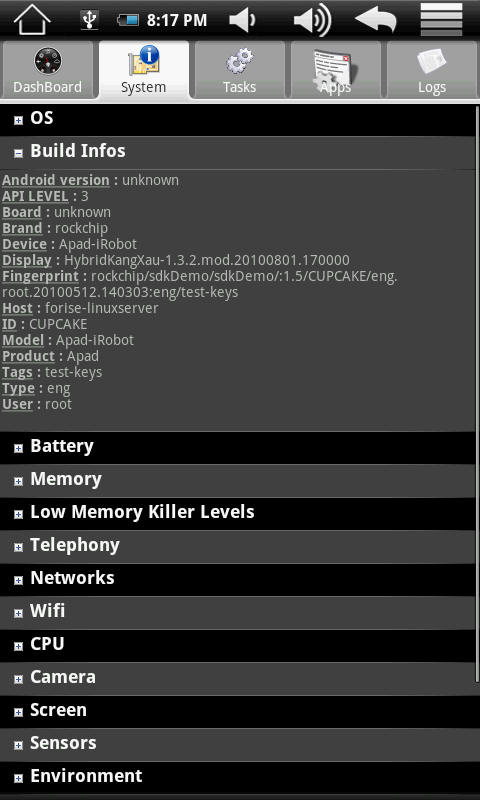 A log of exactly what your Android phone is doing, like what you would find in the Dalvik Debug Monitor (DDMS) used by developers. Use the menu to update, save, or categorize the current log. After I saw this post i was like WOW i need that but I noticed I already had gotten it LOL. In all its GREAT it tells you everything i will hope to use it to gain knowledge about my tablet as its an aPAD (or Asian pad) I need to find out if i can upgrade the firmware although i have eclair 2.1 i would like to try 2.2 or anything. Anyway I found this app easily IDK if i used CHOMP or just the Android Market itself but i remember i searched for something like system information (i don't member my exact search term) but it was something similar and when i chose top apps or something like that it was to top of the top LOL so i figured ill get it. "A" in APAD is "Android" not Asian. So it would seem that even though my Droid can go up to 800mhz it just chooses not to. my wm8505 crashes when i click system. please help!